Your SoP or statement of purpose for MBA application will often be the most important part of your application. MBA places for the best programs are fiercely competed over and you will have to make your application really stand out. Knowing what is a SoP and how to write it that gets you noticed however is not a simple task and many applicants will need support. The admissions committee wants to know more than just what grades you have received in the past. Your academic performance is only part of what they will be looking at. They are looking for applicants that will really benefit from their program and that is going to be able to truly contribute to that program for the benefit of all. This is why you may want our professional support with your MBA SoP writing and editing. We offer you professional advice and help as well as a well-written sample statement of purpose for MBA admission to help guide your writing. With our support, you can be sure you will be able to craft a statement of purpose MBA that will get you noticed. How Do You Make Your Statement of Purpose for MBA Application Stand Out? You will be competing for a b-school place against many others that will have excellent qualifications and experience. So, how you present yourself through your statement of purpose MBA will have a huge impact on your chances of getting selected for a place. Even if you have top-notch grades and are applying to Ivy League schools having a perfectly written MBA SoP is vital to your success. Tailored to the program you are applying to: if you want to show that you are a good fit to their program then you first need to understand just what they are looking for. Always carefully review their expectations so that you know precisely what they expect from successful applicants. Often they will spell out precisely what they are looking for so ensure that this is always reflected in your writing so that they see clearly that you are a good match to what they are looking for. Show progression: they will want to accept applicants that are able to demonstrate progression within their career. Most programs will expect you to have a few years of work experience under your belt when you apply. During those years you need to show that you have progressed in your career by taking on more responsibility. They expect that you will have ambitions that will require the gaining of your MBA. Clear goals: they want applicants that have a good idea of where they are headed within their career. However, while you need to show your goals you do not want them to sound too rigid as a certain amount of open-mindedness is required, after all, you don’t know what opportunities may arise as you work through their program. Precise writing: they want your MBA SoP to stand out. So clichéd or generic statements that provide no real value to your statement should be avoided. These include things such as “great leadership skills”, “Will learn so much from the program…” and other statements that really add nothing. If you have excellent leadership skills then demonstrate them with a clear example. That you really need their program: show that your future career goals and other ambitions require you to gain an MBA. After all, they will not want you to waste your own time or theirs. What Should You Avoid Writing about in Your Statement of Purpose for MBA Finance? No matter what specialism you are applying to for your MBA you need to ensure that you will make an impact. This not only means covering what they want it also means avoiding the many pitfalls that applicants fall into when writing their statements. While a good sample SoP for MBA will show you what you should do they will not highlight what must be avoided. Failing to show career goals: if you have no clear goals for your future then you can be sure that you will have no chance of gaining a place. Covering information from elsewhere in your application: you should not simply be repeating what there is in your resume and other parts of your application. Your SoP for MBA must be unique and add to your application. Not targeting the program: the statement should not be so generic that it fails to show the reader why you are applying to them specifically. Use of clichés: never include overused phrases that will simply add no value at all to your statement of purpose MBA. Every word that you need must add value and be unique to you. Failing to eliminate writing issues: you need to make an excellent first impression and mistakes in your SoP for MBA writing will simply prevent the reader from appreciating what you have to say. Look at statement of purpose examples MBA: a good MBA SoP sample can provide you with a huge amount of guidance for your own writing. However, remember that you are totally unique so there is never any point in simply copying or adapting a statement of purpose business school sample for your own application. Understand what they want: take a long and careful look at what their specific requirements are. Ensure that you answer any questions that they ask you to cover within your SoP and complete it exactly as they specify if you want it to be read. Know what they want in an applicant: carefully review their website so that you fully understand what they see as an ideal applicant. Your SoP for MBA in marketing must be able to reflect what they are looking for. Brainstorm ideas for your statement: make a list of all of your qualities and experience that will make you a good applicant. Also, define your short and longer term goals for inclusion within your statement. Create an outline for your writing: a simple outline will make your writing easier as well as helping you to ensure that you cover everything that is required of you. Work on the opening line of your statement: this is your hook and must make anyone reading want to find out what else you are going to say. Make this first line exceptional so that they will read on. Keep a theme throughout: tell a story rather than simply make a list of what makes you a good applicant. A simple anecdote can provide you with a clear theme that will tie your whole statement together. Keep your writing concise from start to finish: don’t be overly wordy as you have a restricted word count. Make every word count and only include information that is really going to boost your chances of acceptance. Be personal and precise: never talk about other people or make statements that are simply generic or add no value whatsoever to your writing. Check your SoP for MBA admission with great care: allowing mistakes to skip through can sink your application without a trace. Introduction: clearly show why you are looking for a career in your specialism and why you need an MBA. Body Paragraph 1: show your business experience and how you have progressed and gained responsibility in your roles. 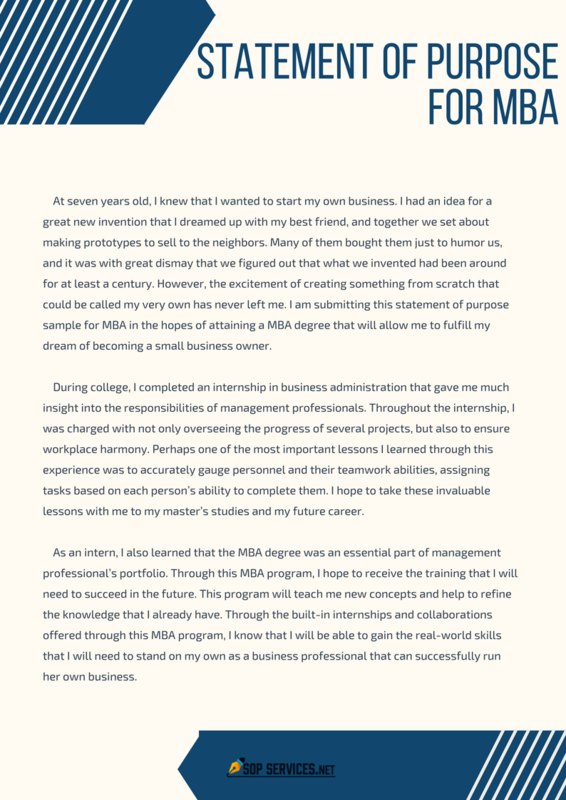 Body Paragraph 2: demonstrate the skills that you have and show why they will help you to be a success in your MBA and future career. Body Paragraph 3: Explain the specific things you hope to gain from their program and what you have to offer. Conclusion: summarize what you have shown and demonstrate how it helps you to achieve your longer term career plans. When you have written your SoP for MBA admission in finance you can use our simple checklist. Is your opening line attention grabbing? Have you explained why you want to study business or your specific specialty? Have you shown you have the skills required to succeed in your studies? Have you shown specifically what you hope to benefit from in the program? Have your shown career progression and ambition? Have you highlighted your medium to long term career plans? Have you carefully checked your writing? If you are in need of help with statement of purpose MBA or writing a statement of purpose for graduate school then our specialized services are here to help. It is not enough to simply have good grades in your STEM subject areas. You have to demonstrate clearly through your statement that you have the skills and the need to gain an MBA. Direct access to a writer with a minimum of an MBA and many years of experience helping graduate students to make successful applications. Original writing that is done according to your needs: your statement is written around your hopes and ambitions and will be supplied with a plagiarism report. Very affordable confidential services: we offer some of the most competitive pricing you will find for the level of quality that you will receive. Quick help: we get the work done to a high standard as quickly as possible and will never deliver to you late. Free checking of the writing: we offer free proofreading to ensure your writing will always be submitted error free. Guaranteed satisfaction with the statement of purpose of your money back. Submit a statement of purpose for MBA application that will get you noticed with the help and support of our highly skilled consultants!